Welcome to another Friday challenge at Winter Wonderland where Danielle is your host this week! 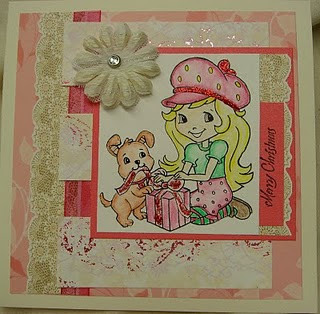 Wow - it was great seeing all your cards and your different takes on Kate's sketch last week. It's great to see so many of you taking up the Christmas card challenges now. If you haven't started on your Christmas card stash, now is the time to start so we hope you'll join us! Congratulations KayC! Please email Kate so you can claim your prize! Here's our Top 3 this week. Everyone's cards were so beautiful so this is always a hard choice but it's great to be able to highlight all the amazing talent out there! Congratulations to our Top 3! 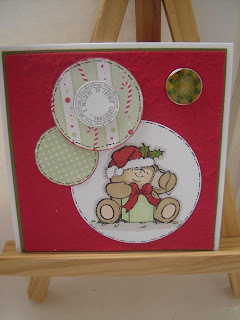 So onto this weeks challenge - 'No Designer Paper'. 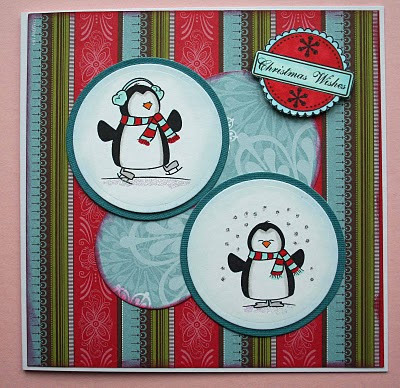 That's right - create a Christmas card using no designer paper. Now that doesn't mean you can't create your own!!! So get creative and pull out your beautiful background/texture stamps or keep it CAS (clean and simple) - the choice is yours! And please remember your card must be a new creation (no back-linking to older cards) and it must fulfill the challenge criteria to be eligible for the prize! 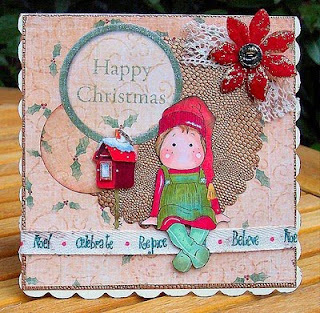 This week we're sponsored by Sassy Studio Designs and they're offering the fabulous prize of 4 digi stamps to the winner! 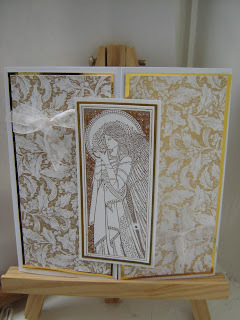 Once again the wonderful DT have come up trumps with fantastic inspiration and beautiful cards. Great job ladies! Well, that's all folks! We hope you're able to join in the challenge this week - we always love to pop by your blogs and see your gorgeous creations! Please remember, we all love to leave and receive comments but time is always in short supply so please be sure to turn off word verification - it makes commenting a LOT easier! Thank you! 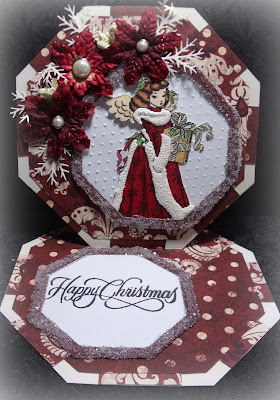 Hello and welcome to another fabulous Challenge at Winter Wonderland - It's Kate here again and I am thrilled to be setting the theme this week. 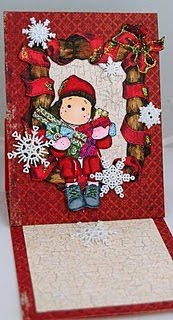 I have been having the best ever fun, hopping about to all your blogs with my teamies, there were some fantastic entries last week, it was so difficult to choose the top three as there are so many talented people coming to share their creations with us and join the in the Christmas fun, although a few of them are a little bit of a stretch on the theme. Remember to be in with a chance of winning the sponsor gift or a top three place, the requirements of the challenge need to be met. If you are not sure these are in blue to the right of this post. 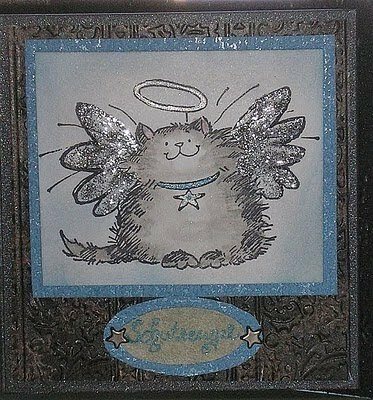 So onto our winner for last week's Glittery Angels Challenge, chosen by random generator who has won a $15 gift certificate from Whimsy Stamps. 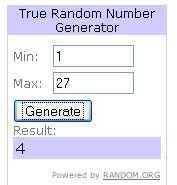 That is number 24 Congratulations Michelle - please email Janet before the end of the next challenge. Here is the winning creation. Please take our top three banner to display on your blog with pride. 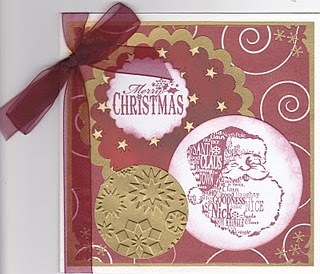 Now you can rotate this or flip it to suit your needs and use your favorite Christmas Stamp and Stash. Who are providing a $15 gift certificate for the lucky winner to spend in their fabulous shop. Simon Says Stamp has over 100,000 items in stock. 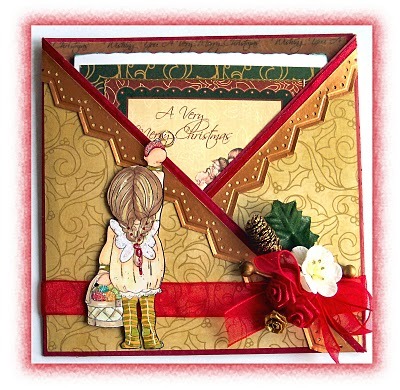 They have all of the latest releases from Magnolia, Whiff of Joy, Tim Holtz, Spellbinders, Copic and so much more! This week brings us again to our Designer In the Spotlight - I would like to introduce you to the very talented Evi. Hi, I'm Evi De Herdt, 22 years young and representing Belgium here. I'm a teacher, so I have lots of time to craft during the holidays. I don't know when I started crafting, but I do know how I got the scrapping bug. My mum went to a workshop and I asked if I could come with her. She couldn't be bothered after wards, but I got busy. 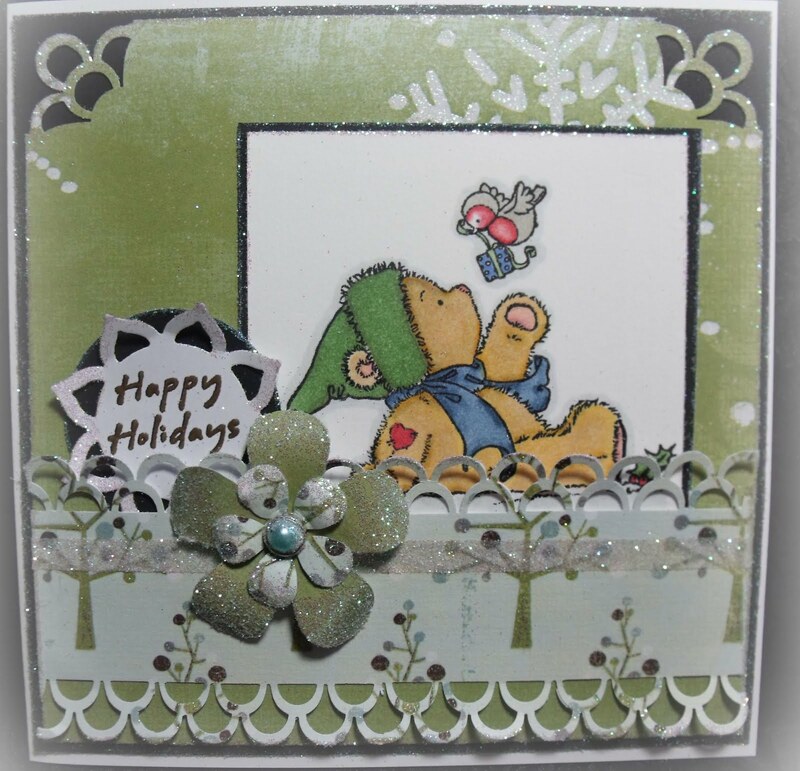 After visiting amazing scrap blogs, I taught myself how to make cards. This is what I do most now, but I like to scrap my pictures into lifelong memories now and then. 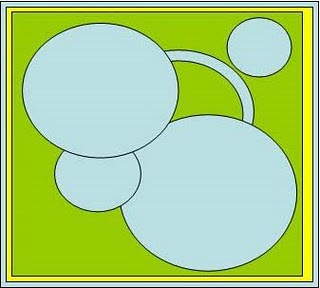 I love to do monochromatic cards and play with circles, so I was very pleased to work with this amazing sketch. I can't wait to see what every one else comes up with. And I almost forgot ..... I love flowers and embellishments. I'd also like to thank Winter Wonderland for having me as a Designer in the Spotlight. 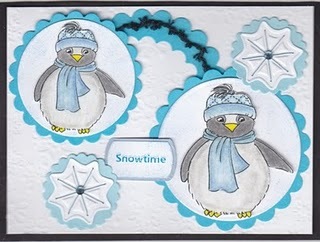 Here is the card that Evi was inspired to create from the sketch. 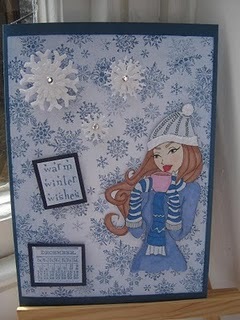 I love the crisp feel to this card and I think I would be hugging myself to keep warm too. 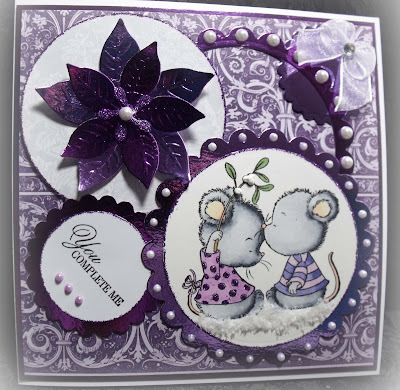 What a great card, thank you Evi for being our Designer in the Spotlight. If you would like to be a Designer in the Spotlight like Evi, please leave a comment after linking your creation and we will be in touch shortly. Well let us see what our fabulous Design Team members have created this week to inspire you all. As you know the team love to combo, so if you click on the name above the creation, the team member will explain how the work was created and also show you what other challenges that they have entered with their creation. Wow ladies what stunning creations. Now we love visiting your blogs and commenting on your gorgeous creations, although it would help if you could turn of word verification as this does add time onto our visits and in some cases prevents us leaving comments. If you need any help finding this, it's in the settings, comments part of your blog. Thanks for your help with this it is much appreciated. We all hope you are able to join us in our challenge this week. 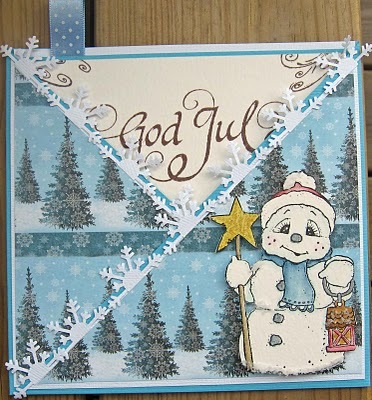 We look forward to visiting your blogs and seeing your lovely creations. 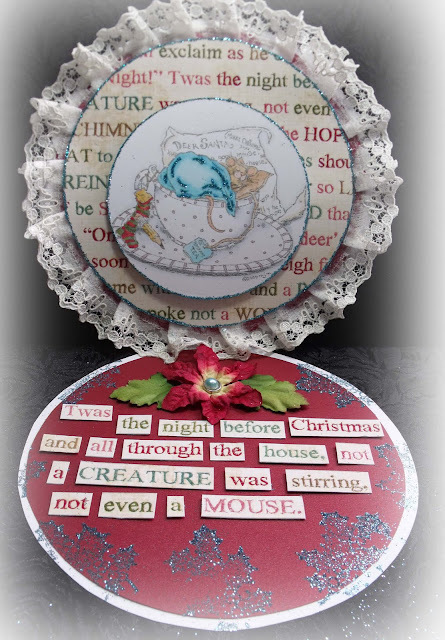 Please be sure to post a link back to the Winter Wonderland blog in your blog post in order to be eligible for this weeks prize. Thursday evening (5pm GMT) is the deadline for your card to qualify for the prizes, if unsure inlinkz below closes and shows the time to closing too. Wow now that was one long post but well worth it, so all that is left for me to say is get creative and leave your entry with Mr Inlinkz so we can come find you asap. 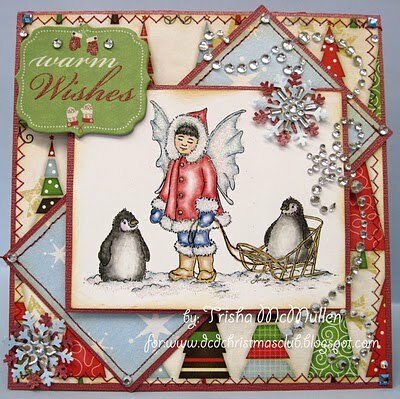 Hello and welcome to another challenge at Winter Wonderland - Marianne here. Firstly I would like to say what wonderful creations there were last week, so many different interpretations of the theme. Thanks for joining in the Christmas fun with us. Some of you must have a nice Christmas collection coming along by now. Secondly we have divided the number of entries between us for commenting as we are now getting so many more entries. This ensures that everybody gets at least one comment. I have had computer problems this week so haven't visited as many of you as usual, so apologies. So onto our winner from last week who has won 3 digi images from Delicious Doodles. Congratulations - please email me here before the end of the next challenge. Congratulations, please take our top three banner to display on your blog. who are offering a $15 certificate to the lucky winner. My fellow DT have as usual come up with the most gorgeous creations which I hope will inspire you too. Don't forget if you click on the name above the picture you can find out how each card has been put together and what supplies have been used. You can also find out if they have combined their challenge with any others, which could give you some ideas. If you would like to be our Designer in the Spotlight for one week, then do let us know by leaving us a comment after the Inlinkz. Thanks to those of you who have already expressed an interest. We will get round to featuring all of you. At the moment it is one a month but we may increase that depending upon interest. Now we love visiting your blogs and commenting on your gorgeous creations which do of course give us inspiration for the challenge too. It would be a great help if you could turn off word verification as this does add time onto our visits and in some cases prevents us leaving comments. If you need any help finding this it’s in the settings, comments part of your blog. Thanks for your help with this it’s much appreciated. We all hope you are able to join us in our challenge this week. 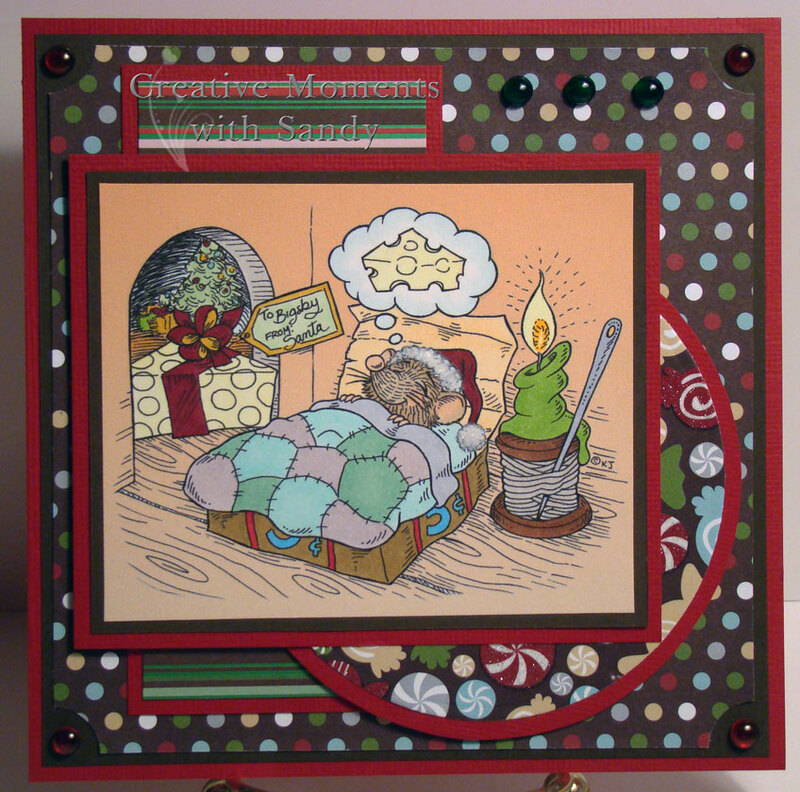 We look forward to visiting your blogs and seeing your gorgeous creations! Please be sure to post a link back to the Winter Wonderland blog in your blog post in order to be eligible for this weeks prize! Thursday evening (5pm GMT) is the deadline for your card to qualify for the prizes!. So all that's left is for you to get creative and leave your entry here with the Inlinkz so we can come and find you asap x Have fun! Hello and welcome to another challenge at Winter Wonderland - Lynsey here. Firstly I would like to say how fantastically creative you all were with last weeks challenge - Some truly stunning creations so thanks for joining in the Christmas fun with us. 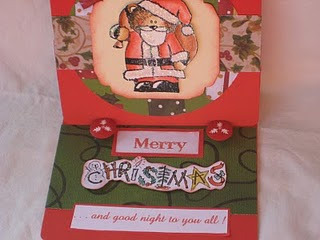 Mandy - Crafty Fox Cards! Congratulations Mandy - please email Danielle at lord.danielle@gmail.com before the end of the next challenge to claim your prize! Wow - such a great number of participants has made it particularly difficult to choose this weeks Top 3! If these numbers keep up we may just have to choose 5 as staying at 3 may prove to be too difficult with such gorgeous work on display! Please take our top three banner to display on your blog. 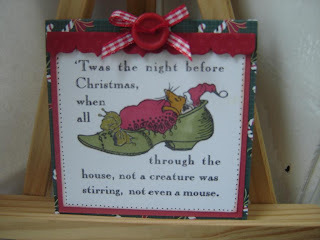 Now onto this week's challenge our theme is 'Twas the night before Christmas'. 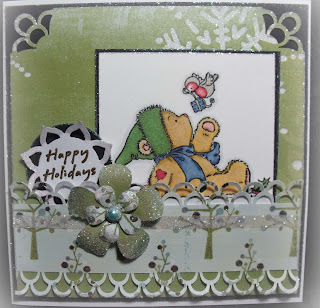 We are sponsored by Teri from Delicious Doodles has kindly offered 3 digital images for this week's winner! Another great prize! If you would like to be our Designer in the Spotlight for one week, then do let us know by leaving us a comment after the Inlinkz. Now we love visiting your blogs and commenting on your gorgeous creations which do of course give us inspiration for the challenge too. It would be a great help if you could turn off word verification as this does add time onto our visits and in some cases prevents us leaving comments. If you need any help finding this it’s in the settings, comments part of your blog. Thanks for your help with this it’s much appreciated. Hi everyone! It's a new month already - can you believe we're in July - that means we've passed the half-way point of the year!! We hope our weekly challenges are helping you with your Christmas card stash! Danielle is host this week and has a fun challenge for you all to join in, but first we will announce last weeks winner and Top 3! Your Strawberries & Cream entries last week were scrumptious - it's wonderful to see such great talent out there! 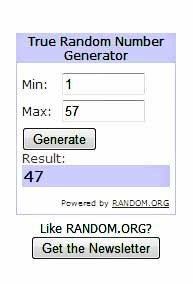 The winner is JLJ Designs chosen by random generator. Congratulations Jennifer! Please contact Kate to receive your prize from Simon Says Stamp - happy shopping! Last week's winner, Julie has asked us to redraw so I started up Random Org and it came up with number 6, Michelle. Please e-mail Marianne as soon as possible. So, onto this weeks challenge which is to Punch It Out! Yep - pull out all those punches and die cuts and show them off on your cards this week. 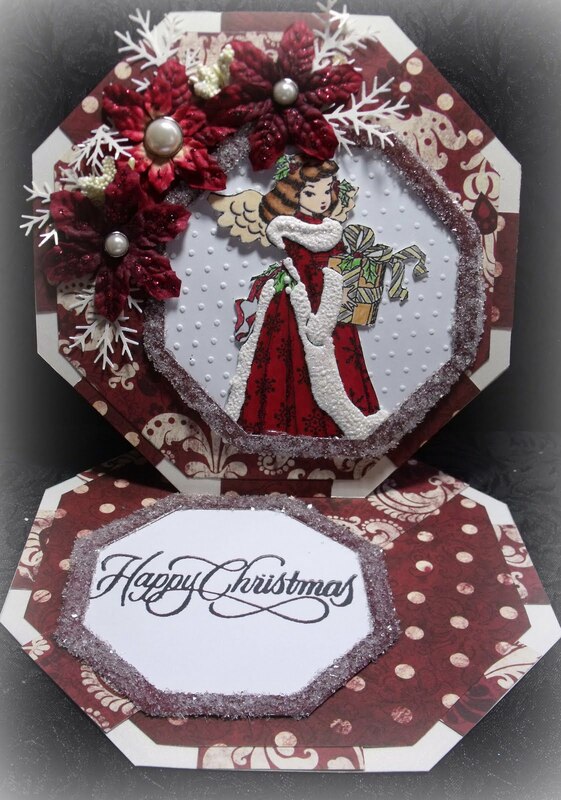 Please remember that to qualify for the prize and top 3 you must make a Christmas card - after all, we are a Christmas challenge! And the DT have yet again come up with some amazing inspiration for you all which should help get those creative juices flowing - we know how challenging it can be to think Christmas when it's summer outside!!! We've really noticed that our participants have turned off word verification so we want to express our thanks to you - it definitely makes our life easier when we come and visit you! We all hope you are able to join us in our challenge this week. 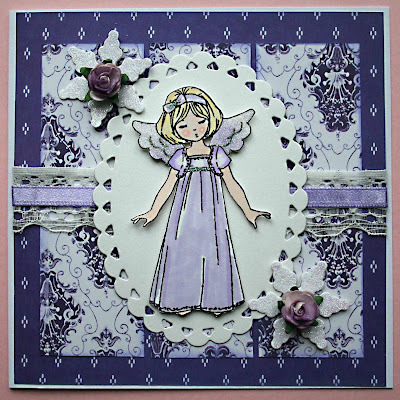 We look forward to visiting your blogs and seeing your gorgeous creations! Please be sure to post a link back to the Winter Wonderland blog in your blog post in order to be eligible for this weeks prize! Thursday evening (5pm GMT) is the deadline for your card to qualify for the prizes! Now all you need to do is get punching (of the creative kind that is) and show us what you've got this week!